I have been meaning to read the Study series by Maria Snyder forever but haven't gotten around to it yet. This is my first book by Snyder and it was amazing! The novel takes place in a fantasy world filled with magic and excitement. Avry is a healer on the run trying to escape from people who want her dead because of her powers. However, one day, she gets caught by a group of rogues who surprisingly, don't want her dead but want to use her power. I liked Avry immediately! She's strong, independent and a survivor. She's also incredibly smart and able to think quickly on her feet without fear does not clouding her like it does most people. Avry is also extremely kind and compassionate , healing people whenever she can instead of placing her needs ahead of theirs. 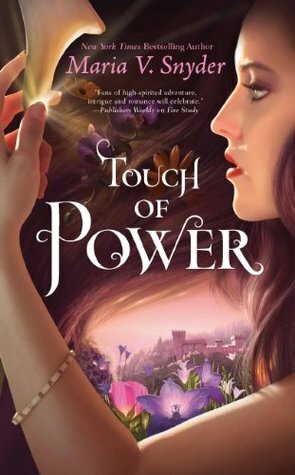 I usually tend to get attached to just one or two of the main characters of the book, but in Touch of Power, I liked of all the characters, even the minor ones. The writing style is easy to get into and Maria's managed to develop Avry's character and environment simultaneously while keeping the story flowing smoothly. Like I said, Avry's always been alone, she does what she has to in order to survive but when she gets captured, she's forced into a situation where she has to spend time with others and it's pretty cool to see her character evolve because of her surroundings. Maria Snyder has created an wonderful, gripping and adventurous fantasy world that leaves you wanting more. I didn't get bored even a single minute! It has been so long since I found a YA fantasy world that I really liked and Snyder's Healer series is the first book to meet the benchmark in years. I can't even begin to express how much I enjoyed Touch of Power, at least, not in words. If you're a YA Fantasy addict, this book's definitely worth checking out. It's an incredible read! Great review! I've got this one on my kindle and am looking forward to reading it. Got this one on hold at the library! Can't wait to get it! Thanks for the review. This sounds really good! I love having characters to love in a book, so it sounds like I would like this one! The concept behind it is interesting too!